Ukraine's petition has been accepted for consideration. The Holy and Sacred Synod of the Ecumenical Patriarchate accepted for consideration the petition of Ukrainian President Petro Poroshenko to Ecumenical Patriarch Bartholomew on granting the Tomos of Autocephaly to the Orthodox Church in Ukraine, the Ukrainian parliament's resolution in the support of the petition, as well as the corresponding petitions of the hierarchs of the Ukrainian Orthodox churches, Poroshenko's website has reported. 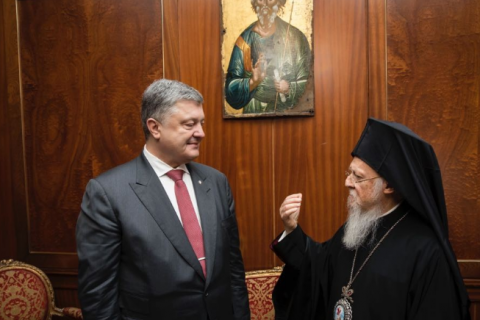 Also, the Synod of the Ecumenical Patriarchate decided to initiate the procedures necessary for the provision of autocephaly to the Orthodox Church in Ukraine. In particular, other local Orthodox churches will be informed accordingly. Pursuant to the instruction of President Petro Poroshenko, on 20 April, a deputy head of the presidential administration of Ukraine, Rostyslav Pavlenko, visited Istanbul and handed over to His All-Holiness, Ecumenical Patriarch Bartholomew the petition of the president of Ukraine on granting the Tomos of Autocephaly to the Orthodox Church in Ukraine. He also handed over the Ukrainian parliament's resolution in support of the president’s petition to the Ecumenical Patriarch. Ecumenical Patriarch Bartholomew also received the petitions of the hierarchs of the Ukrainian Orthodox churches on granting the Tomos of Autocephaly to the Orthodox Church in Ukraine. "As its true Mother Church, it examined matters pertaining to the ecclesiastical situation in Ukraine, as done in previous synodal sessions, and having received from ecclesiastical and civil authorities—representing millions of Ukrainian Orthodox Christians—a petition that requests the bestowal of autocephaly, decided to closely communicate and coordinate with its sister Orthodox Churches concerning this matter," the Holy and Sacred Synod said on its website.